Get the latest scratch off winners stories. We all love a scratcher – how else can you win a life changing jackpot in an instant. A New Jersey woman only meant to buy a $1 scratch off ticket but accepted a $10 dollar one the clerk mistakenly issued. Now she’s happy she spent more than she intended on a lotto ticket. Have you ever wondered how it would feel to be a regular guy one moment and a millionaire three times over the next? Ask Steven W.
A fuel delivery man just received a huge “bonus” while at work, and he’s so happy he’s finding it hard to fight back tears. 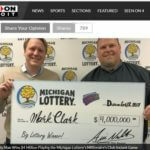 Mark Clark of Monroe plays the lottery, most of the time buying instant tickets during store visits. Why do some people win? In the case of 22 year Army veteran Terry McClelland, maybe because his heart is in the right place. When he stopped by the Speedway on Turnersburg Highway to take a chance of a $250,000 Diamond Dazzler Scratch Off game, he had no idea he would bag the top prize. 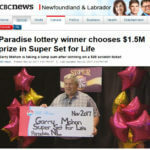 Gary Mahon used $20 to purchase a Super Set For Life instant ticket from Marie’s Mini Mart early in the morning but didn’t consider it important to scratch it right away. 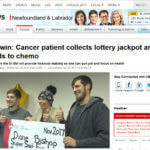 Colton Harrison’s annoyance at not winning anything off previous lottery tickets caused him to buy one more – which gave him the win he had been hoping for. This week a big lottery winner now wants to take flying lessons and buy a plane and a UK man who’s had financial troubles was bailed out by a 500,000 euro lottery win.